The fire in New Mexico has burned more than 30,000 acres, and the Colorado fire has burned at least 2,000 acres. Parts of the southwest U.S. are burning as fires tear through northern New Mexico and southwestern Colorado. 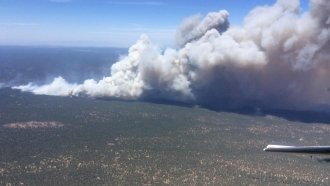 The fire in northern New Mexico has burned more than 30,000 acres as of Sunday afternoon, according to the National Wildfire Coordinating Group. That fire is near the town of Cimarron, which has been ordered to evacuate. The blaze has burned at least a dozen buildings on the Philmont Scout Ranch. Boy Scouts staff evacuated the area Friday. None of that fire has been contained. And the fire in Colorado has scorched more than 2,000 acres. It's located about 10 miles north of Durango. At least 1,500 people have been evacuated. That fire is 10 percent contained. Although meteorologists say there's chance of rain in both states, officials say lightning and wind could make matters worse in New Mexico.